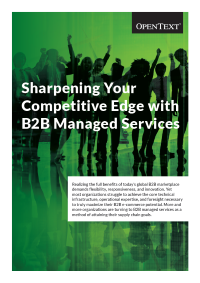 Download this white paper to learn how B2B managed services can improve the capabilities of your business and the issues you should consider when selecting a B2B managed services provider. Integrating a robust B2B e-commerce solutions into your organization provides many advantages in today’s global B2B marketplace. More and more organizations are turning to B2B managed services as a method of attaining their supply chain goals.